Click on the image to go to the Audible page for this audiobook. Maya is a young bee who does not want to want work in the hive. Rather, she wants to explore the world and especially learn about human beings. Youngsters of all ages can learn about the world of insects through Maya’s adventures. While Thornton W Burgess’ stories lead young children to learn about animals and acquire good morals, Waldemar Bonsels’ story leads listeners to learn about the world of insects by giving them personalities. Waldemar Bonsels was a German writer who lived from 1880 to 1952. 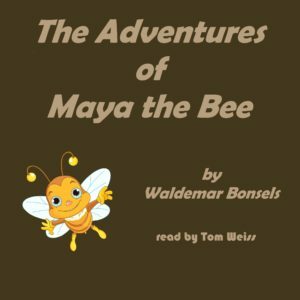 Maya the Bee, originally Die Biene Maja written originally in German, served as the basis for a Japanese animated television series named Maya the Honey Bee in the mid-1970s, as well as a Croatian opera for children.